A RETAIL and tourism ‘market square’ with more car parking space is one of the many ideas unveiled in a pivotal draft blue print for the Port Douglas waterfront south precinct. The land planning exercise will also look to create a more defined tourism and seafood precinct at the waterfront area between the Marano’s Fuel Depot and the Closehaven Marina. 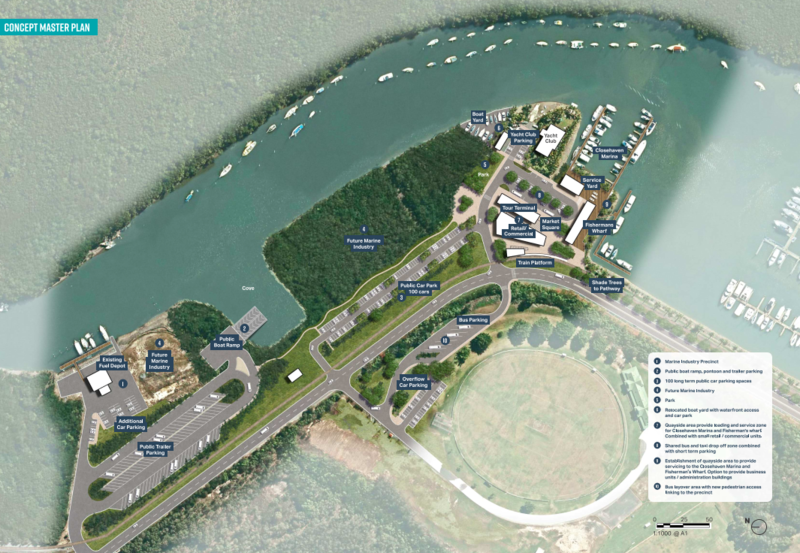 Mayor Julia Leu said the Port Douglas Waterfront South Precinct Master Plan would provide more certainty for the local commercial fishing and tourism industry. “This will shore up that special area and explore its full potential,” she said. Port Douglas is seen as a popular launching pad for eco-tourism as a gateway to the Great Barrier, Daintree Rainforest and Mossman Gorge. But part of the town’s charm is that visitors can watch trawlers unloading their catch through an active seafood industry. The preliminary concept masterplan study takes in stakeholder consultation, environmental, economic, marine and geo-technical and traffic engineering investigations. It evaluates the feasibility of a range of land uses to produce a concept master plan. This work will pave the way for new investment opportunities, sustainability of the commercial fishing fleet, enhanced facilities for private boat owners and the creation of new tourism infrastructure. Council has opened the draft concept master plan up for community consultation. Council staff will be at Mossman Markets on Saturday, September 15. “We want to hear from everyone,” she said. “Council is setting the scene for a prosperous Port Douglas and everyone has a chance to shape this long-term vision. The concept masterplan project is funded with a 50% contribution from the Federal Government under the Regional Jobs and Investment Packages. All suggestions will be considered and where practical and feasible, will be incorporated into the final concept master plan. A summary of the feedback received will be published and how it influenced the final concept plan. – Port Douglas Yacht Club. Public consultation closes on September 30. Creation of quayside area adjacent to Closehaven Marina and Fisherman’s Wharf.